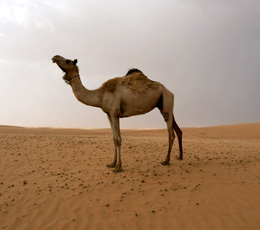 Over the last 35 years land management and farmer lifestyles have changed dramatically on the rangelands of the United Arab Emirates. The human relationship with the rangelands has moved from subsistence to a secondary income or hobby. Both ecological health and indigenous knowledge of the rangelands are in decline. Large areas of the inland desert of the country are rapidly becoming urbanized. This paper reviews threats to the 225 km² Dubai Desert Conservation Reserve (DDCR) as a model of range and species conservation issues facing the country as a whole. Inland desert rangelands are threatened by groundwater depletion, habitat fragmentation, exotic species introductions and overgrazing. Overgrazing is currently the most serious threat to the inland desert, reducing range species diversity, production and available forage. Reduction of stocking rates requires a revision of pro-agricultural policies and resolving the legal ambiguity surrounding common grazing lands. It can be reasonably expected that environmental attitudes will shift from anthropocentric to ecocentric over time, but a shift in cultural heritage perceptions may also be needed to reassert a balanced approach to rangeland management.